During the early days of the history of The Church of Jesus Christ of Latter-day Saints, members experienced and endured unjustified suffering and persecution. On numerous occasions, they were driven from their homes and forced to leave behind many of their precious possessions. Among those things that were left behind, lost, or destroyed were books, coins, notes, and documents which have long since been salvaged as a means of preserving history. Among the rare artifacts that have been recovered from early Church history is an original 1830 first edition of the Book of Mormon. Although the edition is not considered the rarest LDS publication, it is in fact a treasured commodity to be had by serious collectors as it marks the beginning of the Lord’s true Church in this dispensation. Only five thousand copies of the first Book of Mormon were printed, and each sold for the cost of 75 cents. Today it is estimated that only a few hundred copies remain in any condition, and a majority of those are not complete copies. It is interesting to note that in 1998, Bill Gates, founder of Microsoft, purchased an 1830 first edition copy of the Book of Mormon. Two back-to-back pages, which became referred to as “References to the Book of Mormon,” were placed inside copies of the first copies of the 1830 edition of the Book of Mormon to be used as a navigation tool – an index – by missionaries as they used the Book of Mormon to teach the gospel. The pages were not attached which made it easy for them to be lost or destroyed. 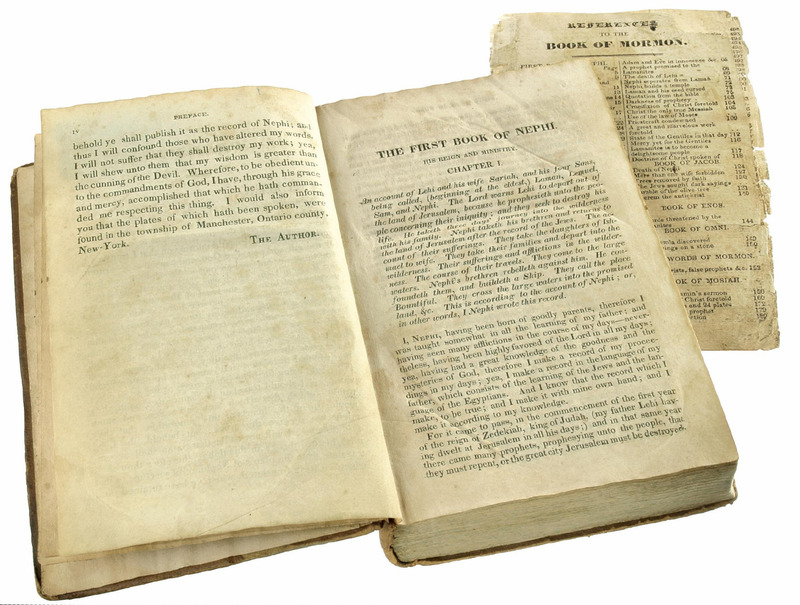 Together with the pages from the 1830 first edition, these have become some of the rarest and most expensive printed pages in the history of The Church of Jesus Christ. In July 1833, the early Church was to publish the first collection of printed revelations in a book titled “Book of Commandments.” The press and the thousands of pages waiting to be folded and cut was located on the upper floor of the home of William W. Phelps. The publication was abruptly disrupted on 20 July 1833 when a mob broke in, chased Phelps’ wife and children out, and destroyed the press. The printed pages were dumped into the street with the intent of the mob to destroy them. In an act of courage, 15-year-old Mary Elizabeth Rollins and her 13-year-old sister Caroline grabbed up as many sheets as they could hold and ran. They were discovered and chased by the mob, but were never found. The pages that they were able to salvage were hand cut and bound into 15 incomplete copies of the Book of Commandments with covers made out of leather, goat hair, and even wood. In 2001, a rare complete copy of the Book of Commandments was sold at auction at Christie’s in New York for the hefty price of $391,000 – the most money ever paid for a nineteenth century American book. The destruction of the Book of Commandments did not thwart the work of the Lord from progressing, nor His Word from going forth. The Brethren immediately began work on compiling another Book of Commandments. However, after deliberating that the book contained more than just commandments, it was agreed that the new book should be titled “Doctrine and Covenants,” and in an 1835 conference, the Doctrine and Covenants was accepted as scripture. In 1836, the first attempts of producing Mormon currency took place in Kirtland, Ohio when the young growing Church decided to establish a bank. The Ohio legislature denied their charter, and so they created the Kirtland Safety Society Anti-Banking Company. The currency that was distributed, known as Kirtland Safety Society Notes, were signed by Joseph Smith and Sidney Rigdon. Like all 1849 gold Mormon coins, the ten dollar denomination features an open eye and a crown surrounded by the words “Holiness to the Lord.” The reverse side of the coin shows two hands clasped. “Pure Gold” and “Ten Dollars” is written around the hands. Unfortunately, the life of the gold coins was short-lived because of their rejection in non-Mormon territories due to their substandard weight. Some banks did accept them at a 25 percent discount, but most were melted. The Standard of Truth has been erected; no unhallowed hand can stop the work from progressing; persecutions may rage, mobs may combine, armies may assemble, calumny may defame, but the truth of God will go forth boldly, nobly, and independent, till it has penetrated every continent, visited every clime, swept every country, and sounded in every ear, till the purposes of God shall be accomplished, and the Great Jehovah shall say the work is done.